HomeBlogsSeth Godin: Marketers need to be proud of the work they do! Seth Godin: Marketers need to be proud of the work they do! During the B2B Marketing Forum that spotONvision organized recently in Amsterdam, I had a unique chance to interview Seth Godin, Marketing Guru of the 21st century. As I had only ten minutes for the interview, I aimed at getting the best possible information from Seth in the most efficient way. In the meeting Seth gave some extra advice and tips and most of all inspiration to marketers. For those of you who prefer to read, I summarized the conversation in an article as well. Seth doesn’t let people comment on his blog, why not? “We are now entering a new age, the post factory age, where everything was made in a factory, candles, insurance policies, consultancies, the model was to get compliant workers, get their obedience, have them do what they are told and then sell more of what they make, And that’s over now!! 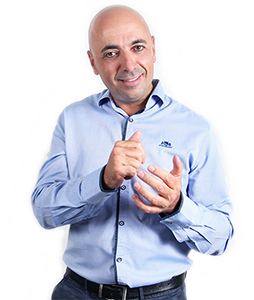 Shimon Ben Ayoun is co-founder and managing director of spotONvision and the B2B Marketing Forum. He helps marketers in the transformation of marketing as 'cost center' to 'revenue generator'. He is constantly looking for innovations in B2B and technology to increase the success of marketers.